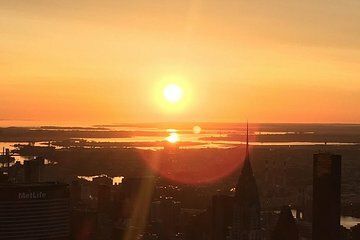 Be among the first people of the day on the Empire State Building observation deck with this sunrise experience. Make your way to the Empire State Building and check-in at the information desk 15 minutes before sunrise, beating the crowds that inevitably arrive later in the day. Meet your group of 100 people or fewer and ascend straight to the Observation Deck on the 86th floor in time to see the sun breach the horizon. Take in 360-degree panoramic views of New York City from every side of the outdoor promenade, staying to enjoy the view from one of New York City's most iconic buildings for as long as you please. When you’re ready, head back down to the ground floor and have the rest of the day to explore. This is ideal for travelers who want to make the most of their day after flying in on a red-eye.